i am very disapointed with this pub, our meals didnt come out together, they missed 1 of our meals off our order and then we waited approx 40 mins for the missed meal to arrive, the staff wernt very apologetic about it atall!!! the meat looked looked like it had been cooked on a dirty uncleaned grill. i wont be eating hear again! i would not recomend to any one! Something about this place. Perhaps it's the grandeur of the exterior leading me to have high expectations but inside I always feel let down. It's like a cross between a Wetherspoons and a youth club with a splash of Macdonalds thrown in, seems a shame really, it's not a place I would want to spend a whole evening. staff were so rude it was unbelievable they got everything wrong and couldnt get us out quick enough, got better service in mcdonalds afterwards!!!!! As a local I can confirm the beer is good although it does at times seem to cater for the younger members of the area. Food can be a bit hit or miss, can be good value for money. Large outdoor area, Duke box, TV and pool table. The Old Rectory is a pub/restaurant (formerly Chimneys) located in a low crime residential area. 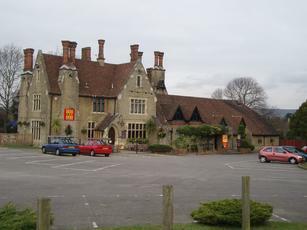 The pub is easily accessible by road (being less than half a mile away from the M20 and A20). The closest railway station is West Malling. Ample parking is available at the front of the premises and as there are shops in the area, you can also park in the shop parking areas should you need to (though I never needed to any time I�ve been there). As I don�t drink, I�ve only ever drunk the coke there, which was nice and fizzy and cooled perfectly. You are always given the option for ice and lemon (it�s nice to be given a choice rather than having them if you want them or not). I haven�t eaten there myself, but they often do a two-for-one meal deal on a Wednesday night (with vouchers). Some friends of mine took advantage of this deal a few days ago. Six meals came to around �15 in total. Very impressive!!! The meals arrived within 20 minutes so very efficient and were enjoyed by all. There is plenty of seating available from hard chairs around tables and a few sofas. They have a plasma TV which often shows sport and a pool table area. Recently, they have held karaoke nights, which proved very popular. The toilets were clean and tidy. The staff are friendly and attentive. A very good pub as far as I�m concerned and always a pleasure going there.